Our United Concordia PPO dental insurance dentist in West Hollywood can keep you smiling. Dental checkups rarely hit the top of anyone’s to-do list, but they play a critical role in maintaining your dental health. We offer convenient office hours and comprehensive dental care to make this essential chore easier on you and your family. Your smile is the gateway to not just good dental health but also good overall health. In fact, poor dental health has been associated heart attack, stroke, infective endocarditis, respiratory infections, dementia and pregnancy complications. One study demonstrated that treating dental health problems can result in a more than 25 percent savings on other medical costs. Our United Concordia PPO dental insurance provider in West Hollywood offers a variety of services including basic cleanings and X-rays as well as preventative care, fillings, restorative treatments, root canal treatments, porcelain crowns, dental bridges, dental implants, dentures, orthodontics, teeth whitening, Lumineers, porcelain veneers and other treatments that can help you get the most out of your smile. Our dental team is committed to your dental health, which means that we will work closely with you to identify your concerns and address each one. We work with you to help you achieve good dental health. We offer educational services to help you learn to take a proactive approach to dental health care, and we offer preventative services that can reduce your risk of dental health problems such as gum disease and tooth decay. Restorative treatments are designed to restore function, health and beauty to your smile while cosmetic treatments can enhance your natural appearance. We offer convenient morning and evening hours, and we have flexible payment options. 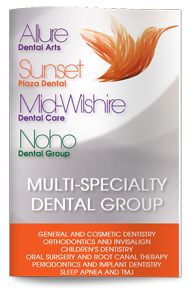 Contact our dental office today to schedule your next appointment with our cosmetic dentist in West Hollywood.